Ballymena Rugby Club remain in the hunt for a high finish in the Ulster Championship League after a 34-24 win over Belfast Harlequins on Saturday. 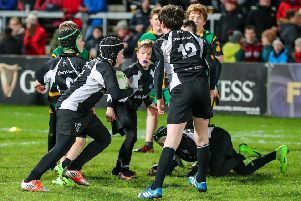 None of the tension of Rome, Edinburgh or London on Saturday was in evidence at Eaton Park, as both sides tried to play an expansive game in near perfect conditions. Quins went on the attack early, and after nine minutes were rewarded with a penalty which Kettyle easily converted. However, when Ballymena got a penalty on the half way mark, they decided to kick for the corner and go for the drive from the lineout. That worked perfectly and despite Quins efforts to stop the maul they drove across the line and James Taggart got the touchdown for a try which Richie McMaster converted for a 7-3 lead. Another penalty in almost in the same spot saw Ballymena repeat the dose, only this time it was Connor Smyth who touched down and McMaster’s conversion attempt failed. Ballymena went further ahead when Jonny McMullan, returning after injury, caught a beautifully placed cross kick from McMaster and scored far out on the left. McMaster made light of the difficult angle, slotting over the conversion to put his side 19-3 ahead. Ballymena were very much on top at that stage and a great period of phase play eventually created the space for Sean Taylor to dot down unopposed in the right corner for an unconverted try to increase the lead to 24-3 before Quins scored a try of their own, with winger Dunlop finishing off a good move. After the restart, a run by Glenn Baillie, some skilful handling by Dominic Gallagher released Connor Smyth to score his second try, which was not converted. Almost from the kick off Ballymena scored again, with James Beattie this time making the running down the right to create the opening and send Taylor over for his second try. The conversion was missed, but with a 34-10 lead, and apparently coasting, Ballymena appeared to relax and allow Quins back into the game. A Willie Stewart converted try reduced Ballymena’s lead and another well worked try by Marshall, again converted, proved to be the end of the scoring.